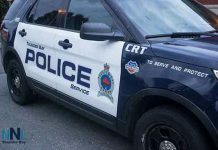 THUNDER BAY – Officers with the Thunder Bay Police Service responded to a reported assault in the 200 block of McKellar Street South just after 6:30 p.m. on Monday February 4, 2019. When officers arrived they found a 62-year-old victim injured and sitting on a snow bank in front of his home. Police learned the victim has been attacked by an unknown person apparently at random. The victim was transported to the hospital via ambulance for treatment of his injuries. During the officer’s investigation, a call for service came in reporting a break and enter at a nearby address in the 200 block of Vickers Street South. When officers arrived they learned a man had broken into the residence and was still inside. Officers were able to arrest the man. Through the course of their investigation officers learned the accused they had in custody from the Vickers Street South incident was connected to the nearby assault. The accused and victim were not known to each other. 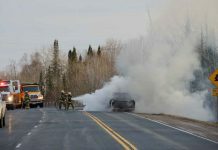 Ryan Milton WINTERS, 30, of Thunder Bay, is charged with one count of Aggravated Assault and one count of Mischief. He appeared in court Tuesday and was remanded into custody with a future date.